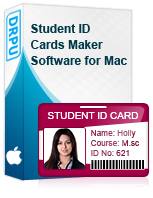 Order Online Students ID Cards Maker for Mac design student ID cards with different barcode value and text on Mac machine. You can save designed student ID card in jpeg, jpg, png and other major file formats. Design multiple student ID cards using Excel data file on Mac.